Statistics is a kind of math that involves the collection and analysis of data. 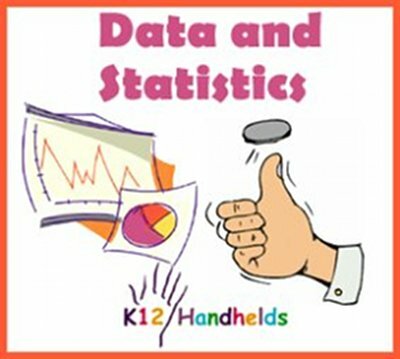 Many jobs use statistics – teachers, insurance agents, sports coaches, and sociologists all use statistics every day. The first step of using statistics is to gather the data. A teacher might need to gather data about the scores students got on a recent test. A coach might need to get data on how the players on an opposing team are performing. The column marked interval tells the grouping or range of data. 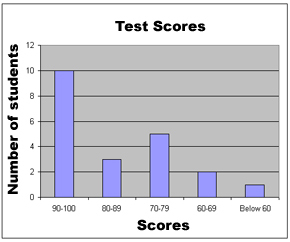 In this case, the data is being recorded according to the range of scores. Students who got a score of 90 or higher are recorded in the first row. Students with a score between 80 and 89 are recorded in the second row, etc. In the column marked tally, the person recording the data makes a mark in the appropriate box for each piece of data they record. 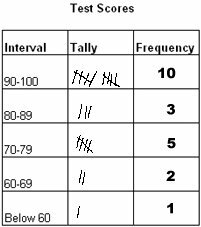 When this is finished, the number of tally marks in each interval are added and the total is written in the column marked frequency. The frequency is the number of occurrences for each interval or the number of times something happened. For example, the frequency of 10 in the first row tells that 10 students got a score of 90-100. After the frequencies are figured out, people often want a nice way to show the data. Graphing is one way to do this. There are many types of graphs. The type of graph that is used depends on the data and which graph will show the information best. When creating or reading a bar graph, the graph is read just like a coordinate plane. (See the ebook on Coordinate Planes for a review of this.) Use the x-axis and y-axis to interpret the data. In the pie chart then, 48% of the full circle is colored for the interval 90-100. This same process is followed for each interval to make the pie chart. When looking at statistics, people often want to know what the data shows. For example, what was the average score the students got? What was the highest score? What was the lowest score? When looking at sports statistics, a coach might want to know how many points the other team usually scores. Who is their highest scorer? To answer these questions, we need to look at measures of central tendency. These are numbers that tell us things like the average, the range of data, and the middle number. There are several different measures of central tendency. Let’s look at each one. The mean is a simple average of a series. To calculate the mean or average, add all the numbers together and divide by the number of items in the list. To calculate the mean, we first need to add all the numbers together. Then we divide by the number of items, in this case 5. The mean or average is 56.6. Another measure of central tendency is the median. The median is the middle number in a series. First, we need to arrange the numbers in order from lowest to highest. Then we need to find the one in the middle. 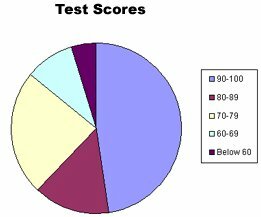 For this set of data, 58 is the median score. Another measure of central tendency is the mode. The mode is the most repeated number in a series. To calculate the mode, list all the numbers in order and find the one that appears the most times. First, we need to arrange the numbers in order. Then we need to find the one that shows up the most times. For this set of data, 75 is the mode. The final measure of central tendency we’ll look at is the range. The range is the difference between the highest and lowest number in a series. To calculate the range, we again need to arrange the numbers in order from lowest to highest and then subtract the lowest from the highest. Then we need to subtract the lowest number from the highest number. One use of statistics is to predict the chances that something might happen. Probability is the likelihood that something might happen. If something is guaranteed to happen, the probability is 1. If it is impossible to happen, the probability is 0. If it is not guaranteed or impossible, the probability is somewhere between 0 and 1. To figure out probability, we need to look at outcomes. Outcomes are all the possible things that might happen. For example, if we flip a coin, one outcome is heads. Another outcome is tails. Those are the only two possibilities, so there are two possible outcomes. If we want to know the probability of one particular outcome, that is called a favorable outcome. If we want to know how many times flipping a coin will result in heads, the favorable outcome is heads. There is one favorable outcome. Let’s do another example. There is a spinner with spots for the numbers 1 through 6. When you spin, what is the probability you will get a 2 or a 4? 6. There is a bag of marbles. It has 3 blue marbles and 9 black marbles. If you draw one without looking, what is the chance you will get a blue marble? When there are a large number of possible combinations of outcomes, it is helpful to have a way to figure out how many there are. One way is to draw a picture. We can use a tree diagram to do this. Suppose you are choosing an outfit. You have four pairs of jeans and three sweaters. How many different outfits can you make? If we count all the resulting options, there are 12 different outfits that can be made. A short cut to figuring out the number of total combinations is the Counting Principle. The Counting Principle says that to find the number of different outcomes of multiple items, you multiply the number of outcomes for each item times the number of items. This is the same answer we came up with using the tree diagram. Suppose you are buying a new skateboard. There are 6 different kinds of wheels you can choose from. The skateboard you want comes in 10 different colors. How many different combinations of choices do you have? Using the Counting Principle, we multiply the number of choices for one item times the number of choices for the other. You have 60 different combinations to choose from! Now, you try a couple. 7. You’re ordering a pizza special with one topping. There are five different choices of toppings. You can get the pizza with thick or thin crust. How many different combinations of pizza are there? 8. Brian is making an ice cream sundae for his mother. They have chocolate, vanilla, and strawberry ice cream. They also have hot fudge, marshmallow, pineapple, and butterscotch topping. If his mother wants one flavor of ice cream and one kind of topping, how many combinations does she have to choose from? In the above examples of combinations, the order of the items or events didn’t matter. There are some arrangements though, where the order is important. When the order is important, the number of possibilities is called a permutation. Let’s look at an example. There are four students, Julio, Angela, Adam, and Shanna. They are lining up to go to lunch. How many different orders are possible? This is a permutation because order is important. If you count out all the different permutations, there are 24. That’s a lot of work to list those all out! Fortunately, there is a short cut. We can figure out the number of permutations using something called factorials. This is said “four factorial”. This is the number of permutations for 4 different items, as we found above. She must use each character and can only use each one once. How many different choices does she have? She has 720 different choices. Now, you try a few. 9. There are 5 cars that need to get on the ferry. How many different orders are possible for the line of cars? 10. The four high school bands that are going to be in a parade. How many different arrangements are possible?